Juicy berries, crunchy walnuts plus yummy cream cheese and warmed up maple syrup make this a fantastic breakfast or brunch dish for Thanksgiving, Christmas and New Year’s Day! It is an established fact that my family loves French Toast (or eggy bread as my British hubby would say) for breakfast and especially for brunch. I have a few versions of it including 3 in this blog! We surely cannot get enough of it. 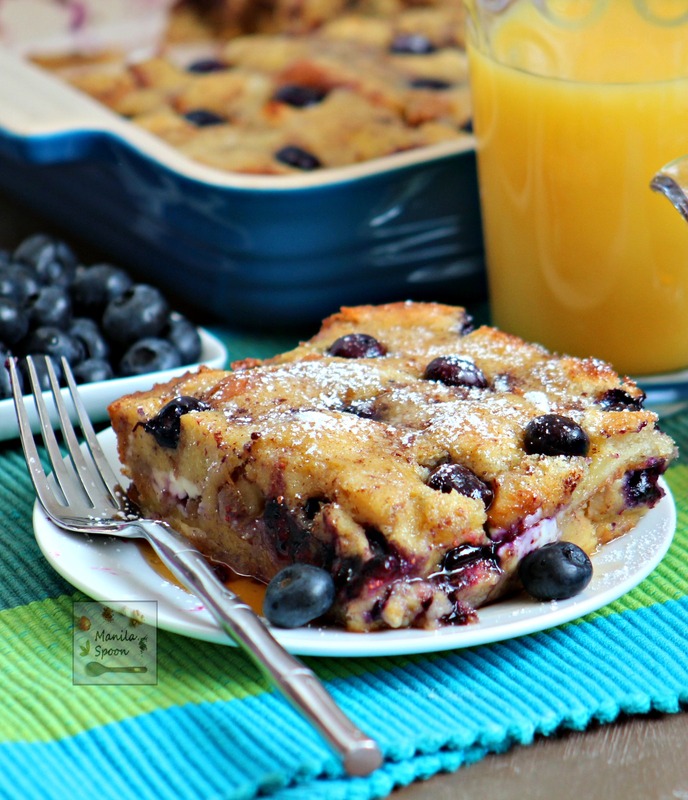 I have tried many variations of this delicious American-style stuffed French toast but the blueberry version is one of our favorites. It is just so wonderful to bite into this warm overnight-soaked baked bread and then into your mouth suddenly burst delicious juices from the berries! But that’s not all – the almost melted cream cheese provides a delightful contrast of texture and flavor which makes your palate truly dance with joy! As if that’s not enough, make it even better by drizzling your freshly baked french toast with warmed up pure Maple syrup and then help yourself with a generous dusting of powdered sugar on top to add extra sweetness and love! Aren’t you hungry yet? This version is good for about 4-6 servings. I only have a small family of 4 and to leave any guesswork every time I make it, I have finally decided to jot down my exact measurements and how I make it. Of course, this can easily be doubled when you are serving more. Just use a 9 x 13 baking dish instead. Please enjoy! Evenly scatter the cream cheese cubes, nuts, and blueberries on top. Cover completely with the remaining bread cubes. In a large bowl, whisk together the eggs, milk, brown sugar, vanilla, cinnamon, nutmeg, and cloves. Evenly pour the egg mixture over the bread cubes. Gently press down on the cubes with your palms to allow the top layer of bread to absorb the liquid. Cover with plastic wrap and refrigerate overnight. The next day, preheat the oven to 350°F (175°C). Meanwhile, remove the dish from the refrigerator and let sit for 20-30 minutes at room temperature. Bake the French toast covered for 20 minutes. Take the dish out of the oven, uncover and then take the remaining blueberries and gently press them into the bread evenly spreading them all over. Return to the oven and bake for another 18-20 minutes or until the cubes are nicely toasted and there’s no more liquid at the bottom. Hi Manila Spoon, your post made me realize I haven't had my breakfast yet. Yummy post. When are you swinging by Manila again? Am not sure yet, hopefully soon. Thanks, January Roads. I do miss the Philippines. Those are fresh blueberries, yummy! I haven't tried baking but when I decided to, gonna use this recipe for my first piece. Oh, you're going to love this iAn! Please enjoy! Abby, this french toast bake looks SO good! I love those sweet blueberries studded through it. Thanks, Cindy! Adding those blueberries on top was a last minute whim but am so glad I did it, it made this already yummy dish even better, for me at least. Glad you stopped by. Did you cover the casserole with foil the 2nd time you baked it for another 18-20 mins.? Not anymore, Tinay 'cause you want it to brown and become a little crispy on top. Please enjoy! Wow!!! Wonderful….can't wait to make this one and soon. Hope you enjoy it William! I made this wonderful dish today. I made a few slight alterations which included: Gluten Free Brioche Bread (8 oz), Blueberry Philadelphia Cream Cheese, and reduced the eggs to 3. My family absolutely loved it. When they say, "This is going on the menu", you know you have a winning dish. Thank you for sharing new family favorite. Thanks, Nicole! I hope you enjoy it. I made this as well! New favorite i used chocolate cream cheese and was delicious! I am so delighted to know that Becky. Thank you very much. Just finished putting two casseroles for my daughter's bridal shower. Even unbaked they look and smell wonderful. I can hardly wait to pop them in the oven. Thank you! Wonderful, Denise! I do hope you all enjoy it! Thanks for trying it out. Yum!! 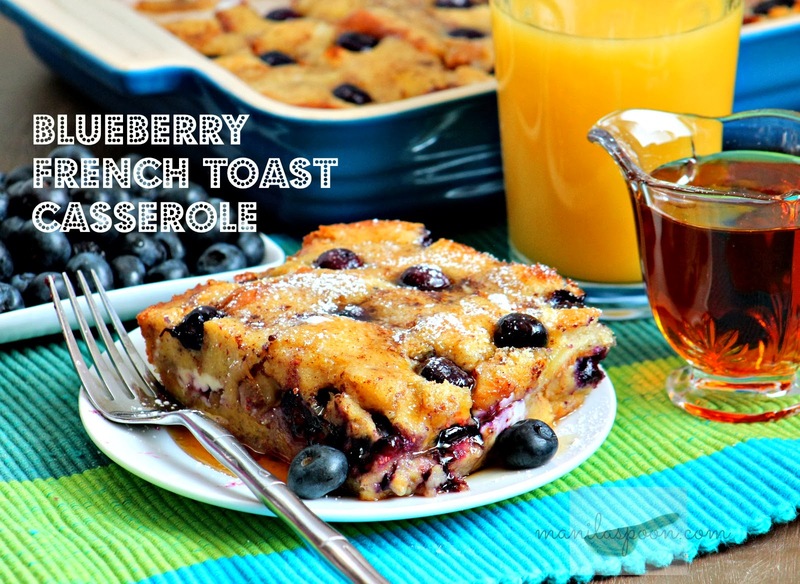 This sounds like the perfect brunch dish, especially while we have guest staying with us over the holidays! I can't wait to try this out! I LOVE blueberry flavored sweets! 🙂 Thanks for this great idea! I haven't tried it with frozen blueberries but I think it should be fine provided you thaw it first as it will sit on the fridge overnight so better to remove excess liquid from it before using. WOW !!!!! Awesome recipes, going to try it this Sunday ! EASTER BRUNCH !!!!!!! Any suggestions if we have nut allergies? Would it work with leaving them out or should there be some sort of substitution? You may leave it out, Marti. It should be fine. Hope you like it. Seriously it really looks delicous. Gonna let my mom make this for us. Brioche bread seems so expensive. How is it with the Hawaiian sweet rolls ? Is it much different ?? I have used Hawaiian sweet rolls and they're perfect for this! Enjoy!!! What a fabulous breakfast!!! My family will love it! Happy New Year! Blueberry cream cheese anything is delicious! Can't wait to try this! Can I use strawberries instead of blueberries? Yes, that’s fine. Choose the berries you like. wow! it looks very yummy! thank you for this! Do you have to make it the night before? You can make it the same day but doing it ahead is more convenient plus the bread absorbs the custard sauce better that way.